Is your cat sitting inside bored all day long? Is your dog chewing up your leather boots because there’s nothing better for her to do? 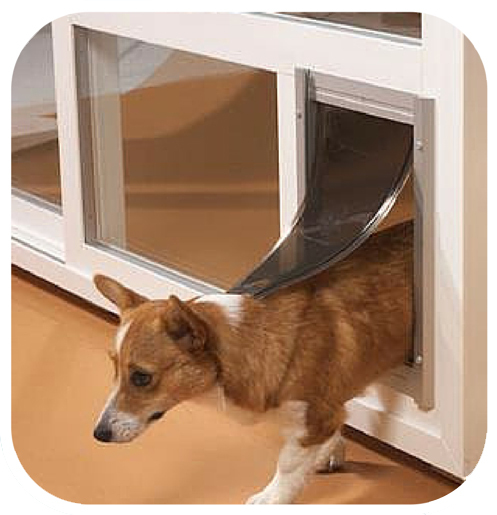 Maybe your critter needs a pet door! Consider: it’s easy for us humans to come and go as we please, but our pets on the other hand (at least, the majority of them) just aren’t able to open the door up and let themselves out for a breath of fresh air. If you’ve been thinking about window and door replacements for your home and about increasing your pet’s quality of life, now is a great time go for it! Window replacement season is here — the Northwest sun is finally beginning to shine! — and the expert craftsmen here at Clear Choice Windows and Doors are committed to providing you with the very best replacement windows and doors available. By installing a new pet door for your dog or cat (ensuring, of course, that your outdoor area is secured for safety), you will be granting your fuzzy friend a freedom we humans take for granted: the freedom to come and go as they please. Pet doors keep your pets active, stimulated, improve their confidence and attitude, help them stay fit and trim, and allow them to escape from any possible dangers — in doors or out. Just imagine how great you’ll feel knowing your pet’s living free and easy — no more sad eyes when you leave for work in the morning! No more guilt trips and broken hearts! If you’re getting some replacement windows and doors for yourself, why not throw in something extra for Mr. Bootsie? Our vinyl pet doors are attractive, durable, and designed to be energy efficient, and when you go with Clear Choice Windows and Doors for your pet door installation, you will always get the most reasonable price and the best service available anywhere. Woof. Meow. Guaranteed.